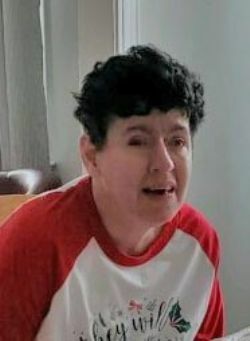 Lesley Dru Miller, 53, died peacefully in Christ on April 12 at Willis-Knighten Medical Facility in Shreveport, Louisiana. Lesley was a resident of Holy Angels Residential Facility in Shreveport for more than 30 years. Lesley loved life and her family, both at home in Mobile and at Holy Angels. All of her friends, as she called most everyone she knew and loved, will remember her by her boisterous laughter and her obsession for purses, preferably full of quarters. Lesley loved to sing and dance and always kept a sharp eye on an all the goings on in the dorm, ready to give a full report when asked. Christmas was always highlighted with Lesley’s singing Christmas carols and exuberance when opening all of her presents from Santa. Lesley is survived by her mother, Olavee Mathews Miller, brother John Miller, brother Christopher Miller, his wife Yumi Miller, niece Jessica Miller, nephew Christopher (CJ) Miller, sister Elizabeth Miller, aunt Margaret Jacob, cousin Leigh Parks, cousin Natalie Forman and Cousin Brett Foreman. She is also survived by the residents of Pollard and Madonna Hall and the staff who has lovingly cared for her for over three decades, especially Francis, Katrina, Julie, Marvette, Mrs. Salley, Jackie B., Nicole, Sandra, Linda, Janis, Patsy, Cathy and countless others that make up her Holy Angels family. Lesley was preceded in death by her father, Frederick Bernard Miller. Visitation will be held from Mobile Memorial Gardens Funeral Home on Saturday, April 20, 2019 at 1:00 PM followed by graveside services and interment at 2:00 PM in Mobile Memorial Gardens. In lieu of flowers, the family requests donations be made to Holy Angels, 10450 Ellerbe Rd., Shreveport, LA 71106. Arrangements by Mobile Memorial Gardens Funeral Home. A graveside service will be held at 2pm on Saturday, 04/20/2019.